Will we ever see Red Dead Redemption 2 on PC? Rockstar's open-world Western game Red Dead Redemption 2 launched on console to huge acclaim last October, with Red Dead Online now in beta alongside the epic-sized single-player campaign. So far, however, the game is only available on Xbox One and PS4. While that's not exactly a restrictive release, committed PC players have been left twiddling their thumbs in the vague hope of a Red Dead Redemption 2 PC port coming down the line. Players hungry for a high-spec or 4K experience can opt to play the game on the PS4 Pro or Xbox One X, but there's nothing quite like a souped-up PC rig to bring out the finer details and see what Rockstar's game engine can really do. So if you don't have a console from Sony or Microsoft, what are your prospects for getting Red Dead Redemption 2 on PC any time soon? We've run through all the latest rumors pointing to a PC release, and made our best guess as to when we'd expect it to land. Will we see Red Dead Redemption 2 on PC? 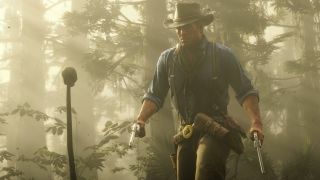 Rumors kicked off in mid-October about a possible Red Dead Redemption 2 PC release, after the online retailer MediaMarkt listed a PC version of the game on its website, with a placeholder date of December 31, 2019. The listing has since been pulled, however. Things heated up again after a LinkedIn profile for a Rockstar employee appeared to list credits as a programmer on the PC version of the game – though this, again, was amended after the media attention that attracted. The firmest clues we have appeared when Rockstar released a mobile / tablet companion app alongside the new Red Dead game, mainly as a hub for viewing in-game stats, journal entries, and map locations (see image below). Some savvy data-mining, though, contained references to PC-quality graphics settings – shadow quality, grass rendering, and the like – as well as lines explicitly naming PC, such as 'PARAM_companionAutoConnectIpPC' or 'CommandIsPcVersion(void)'. You can see the full list on Rockstar Intel. There's also a reference to 'Oculus', which can only really refer to VR capability for the game. Given the option to play the entire game in an immersive first-person perspective, virtual reality would be a natural fit – and Red Dead 2 VR would be most at home on a dedicated Oculus or PC-bound headset. So when could we see Red Dead Redemption 2 on PC? At this point Rockstar is unlikely to make an announcement anytime soon, as the studio seems to be focusing on Red Dead Online. While 2010's Red Dead Redemption never came to PC, previous Rockstar games like GTA IV or GTA V both took around six months to make the jump to PC after their initial console launch. So that means we could be looking at an April/May 2019 launch date this time around. Given the scale of the the open-world game, it's not wholly surprising for a PC port to follow a few months after – it takes a lot of work to get the game running on different systems. But the longer PC gamers have to wait, the less likely they are to maintain their anticipation.